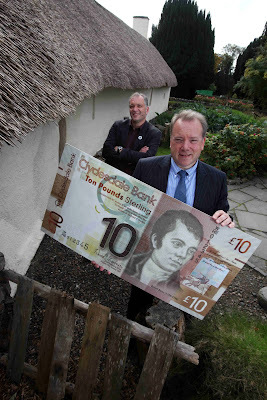 Robert Burns, one of Scotland’s most famous sons, is featured on Clydesdale Bank’s new £10 note, which is now in circulation. This note is the fourth of Clydesdale Bank’s new world heritage banknotes which are now available at selected Clydesdale Bank cash machines and retail branches across the country. As well as featuring ‘The Bard’ on the front, the £10 note will also depict an iconic image of Edinburgh’s Old and New Towns on the reverse. Clydesdale Bank’s new note collection showcases the best of Scotland’s heritage, people and culture and is the first time in more than 20 years the Bank has launched a completely new set of notes. Robert Burns was chosen to feature on the Bank’s most-used banknote to coincide with the year of the Homecoming – which celebrates the 250th anniversary of his death. The front of each new note will honour a prominent and innovative Scot while the reverse will feature one of Scotland’s five World Heritage Sites. Clydesdale Bank is the largest issuer of banknotes in Scotland, with more than £1.1billion in circulation in any given week. Willie Mackie, managing partner of Clydesdale Bank’s Ayrshire Financial Solutions Centre said: “Clydesdale Bank’s new £10 note reflects Scotland’s excellent worldwide reputation. We are extremely proud to mark the remarkable achievements of Burns, especially on the 250th anniversary of his death. Nat Edwards, director of the Robert Burns Birthplace Museum in Alloway said: “Robert Burns is one of the most significant Scots of all time. His work is known and celebrated across the world. Burns is regarded as a pioneer of the Romantic Movement, and was a source of inspiration to the founders of both liberalism and socialism. The new notes are the first in the UK to use a new ‘depth image’ hologram security feature – which is a moving hologram behind the prominent front image. The bank’s £5, £20 and £50 notes, featuring Sir Alexander Fleming, Hebridean Island St Kilda, Robert the Bruce, New Lanark, Elsie Inglis and the Antonine Wall respectively have already entered circulation and are widely available from cash machines and retail branches throughout the country. Notes from the new collection were part of Clydesdale Bank’s recent charity auctions of rare and valuable bank notes, where a £1 note sold for £9,000 breaking the previous world record for the sale of a Scottish bank note. In total, across the two auctions, the Bank raised more than £200,000 for charities across the UK. There are currently 623 Ayrshire business stories permanently archived on this site. To locate those of most interest to you, please use the site search facility in the top left hand corner of this page. Type your search term in the white box, then click the magnifying glass symbol.